One of my loves are lighthouses and on this trip we have seen a few. Some were the classic style, there was a modern square one and a triangle one, but then we saw this lovely old timber one that was rescued from deterioration. There are two levels where the keeper lived, then you climbed a narrow staircase in the central pipe to the top. I have photos on another camera that I know you would love of the interior but that will have to wait till I return. Nearly on every trip you tend to come across a "big" thing, they usually can be found in small towns. I suppose it's one way to get people to stop. 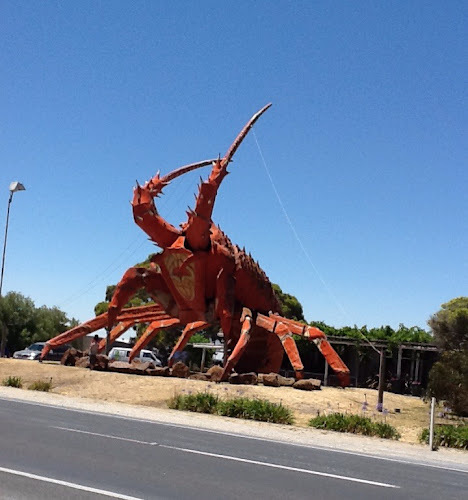 This is the Big Lobster, we found in a town I can't remember the name of. I've been told that on the trip home we'll come across the big scary looking koala in a town with a name that wasn't remembered either. Pot holders from op shop .50 cents each. Working on cross stitch when I get a chance. I love the art work on these vintage 1960's Agatha Christie Fontana books and have found a few at oppies along the way usually for about $1.50. This one is my latest holiday read, I've gone from a trashy romance to a classic who done it. Yay! I'm half way through and I think I know who it is, but don't tell me. Would I spoil it if I said it's probably the butler?!! I actually remember the covers of those Agatha Christie books - my brother's had the set. 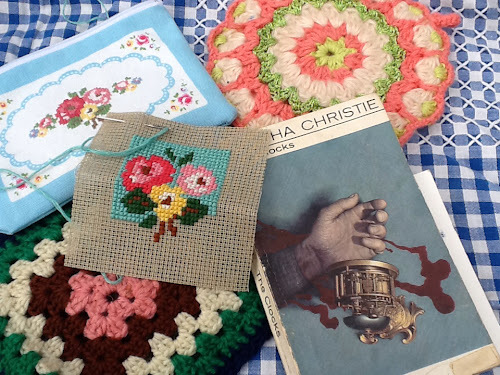 Loving your cross stitch, nice to have something crafty to do when you're on the road. 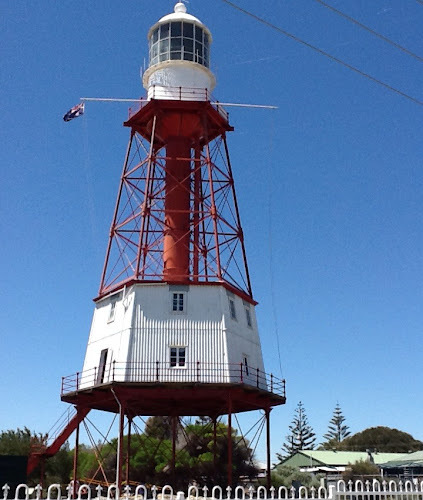 that giant lobster is a bit scarey!...I had a laugh cause we got to see the giant prawn on our holiday (and a cute little lighthouse! )cant wait to see the inside pics!....happy holidays!